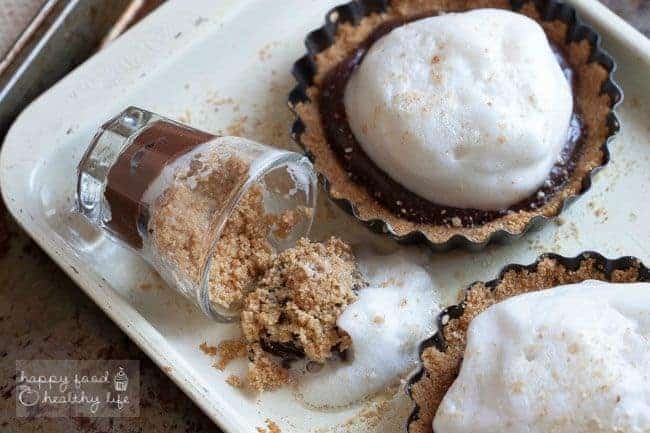 1 Vegan S’mores Recipe. Served Two Ways. 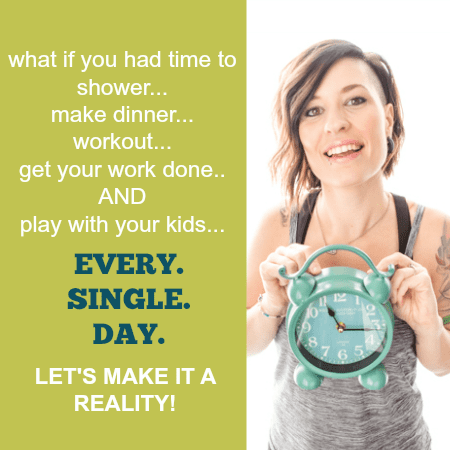 You pick how you want to make, serve, and eat it depending on your mood! First thing’s first. I’m just gonna get it out of the way and let you know that I’m not apologizing for the sheer amount of photos happening in this post. Seriously. I had to cut it down from about 99-billion pics to these few, and that was hard as heck because they’re all like my little babies. And what can I say, this dessert is one that is ridiculously photogenic. Wouldn’t you agree? 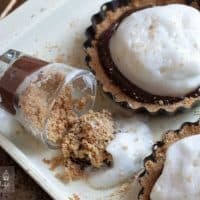 I have to say, I never thought a s’mores recipe would find it’s way here on the site since I’ve really cracked down on the health-factor of things. But my, oh my, did I find a solution! As you probably know by now, I celebrate those crazy food holidays once a month with some of my blogging friends. We’ve done waffle day, ice cream day, peanut butter day, and lots more! But I have to admit, when I saw that National S’mores Day was coming up, I thought I’d have to bow out. I couldn’t for the life of me come up with something that would fit the healthy bill. And I’m done bending the rules like I’ve done so many times in the past. I’m all about REAL ingredients. WHOLE ingredients. NON-PROCESSED ingredients. At least I’m trying my best. I know I’m not perfect and I don’t expect anyone else to be either, but I definitely do make a true attempt. Now maybe you’ve noticed in the past that I actually have posted a S’mores recipe here. It was my fruit-filled homemade s’mores, and although the marshmallows are homemade from scratch, I have to admit, I do cringe a little every time I see them. You see – gelatin. I’m not going to go on a full-on animal rights rant because that’s not what this is about. But do you know what’s in gelatin? Gelatin is made from the protein of animal by-products such as skin, tendons, ligaments and bones. Yeah, I’m not really down with that. I see no reason to have animal skin or bones in my marshmallows or jello. END RANT. So you’re probably wondering what the heck this marshmallow looking stuff is, right? Remember last week when I told you all about the awesome vegan whipped cream I made? 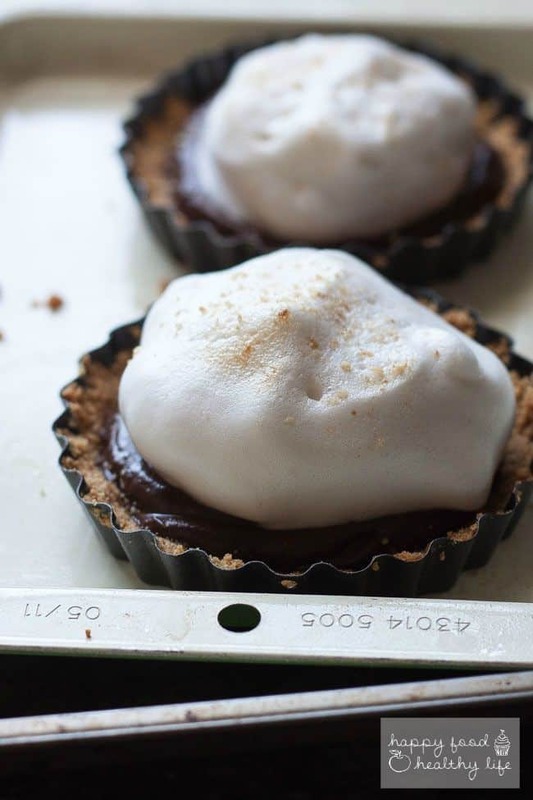 Well, it turns out it tastes a whole lot like marshmallows, and when you pair it with chocolate and graham cracker, there’s no doubt that you’ve got the flavors of a S’more. 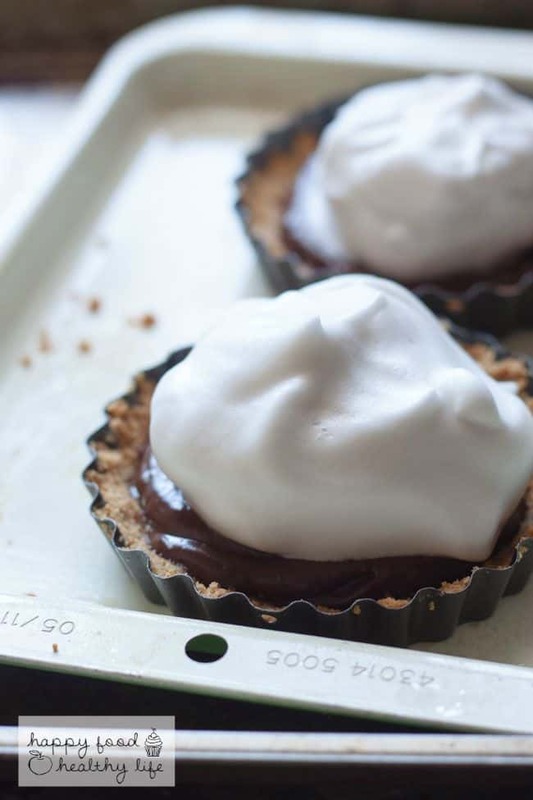 So as I was making these, I was only planning on making tarts but really didn’t want more than two hanging around the house, so I thought of what to do with the remaining ingredients. I looked through my dishes for a cute bowl to place it in so I could dig in later with a spoon. And then I realized… hey, I don’t need a big bowl-ful of this goodness. I just need a little taste. Then I looked one shelf down and saw them… the cute little mini shot glasses I bought from IKEA a few months ago and have been meaning to use. I knew when I bought them that they’d be the home of desserts more often than actual shots. So that’s that. You get to choose. Tarts or shooters. 1 Vegan S’mores Recipe – Served 2 Ways – You choose how you want it! Combine graham crackers and melted coconut oil in a food processor and pulse until combined and the graham cracker crumbs begin to stick together. Stop to feel the crumbs. If they stay together after you press them together, they are ready. 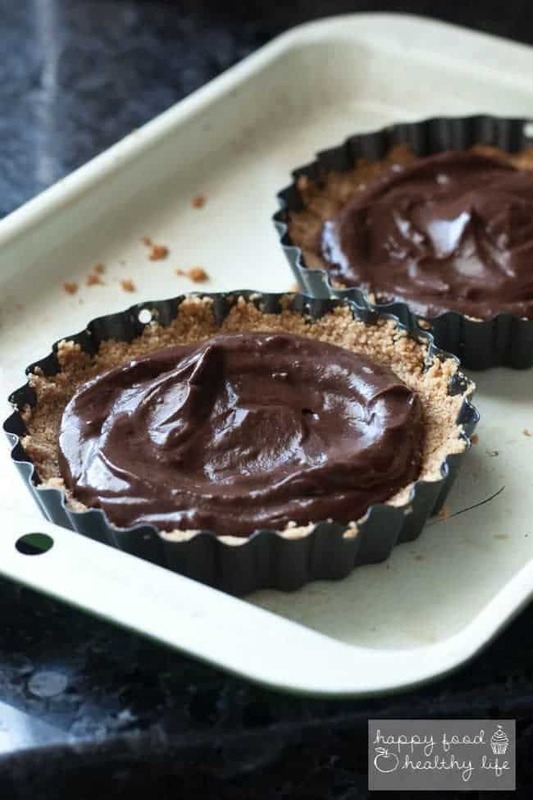 For tarts: Press into mini tart pans and bake for 10 minutes in preheated oven. Remove and let cool. For shooters, set aside. For the pudding. Cut avocado into pieces and put in food processor or blender. Add the cocoa powder, stevia, milk and vanilla and blend until the pudding reaches the desired consistency. Chill for at least 1/2 hour before assembling dessert. For the whipped cream: Combine all ingredients in a mixing bowl, and using the whisk attachment, mix on high for about 14-16 minutes. For the first while, it will appear that nothing is happening, until about 10 minutes in. Then you will see that it's starting to thicken. You can taste it at this point to adjust vanilla and sweetener levels according to your taste. Make the cream right before serving. To assemble tarts. On top of cooled crust, place a couple large spoonfuls of chocolate pudding. 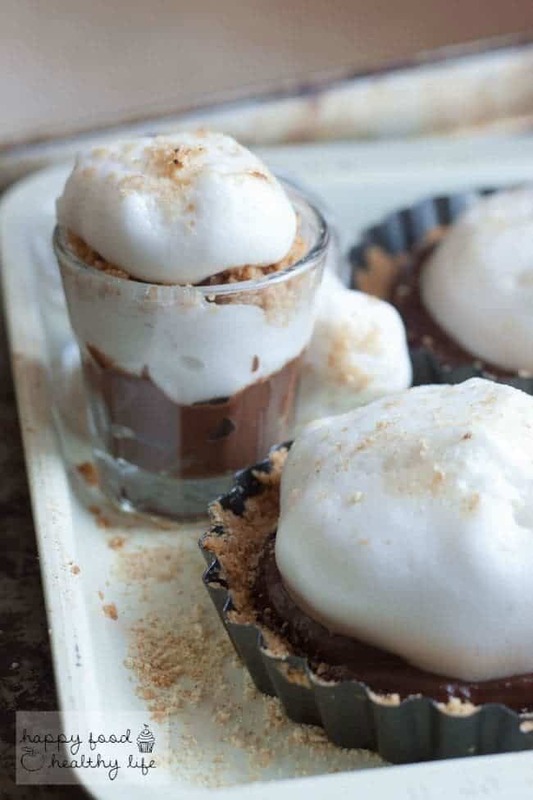 Top with whipped cream and graham cracker crumbs. With a kitchen torch, brown edges lightly. 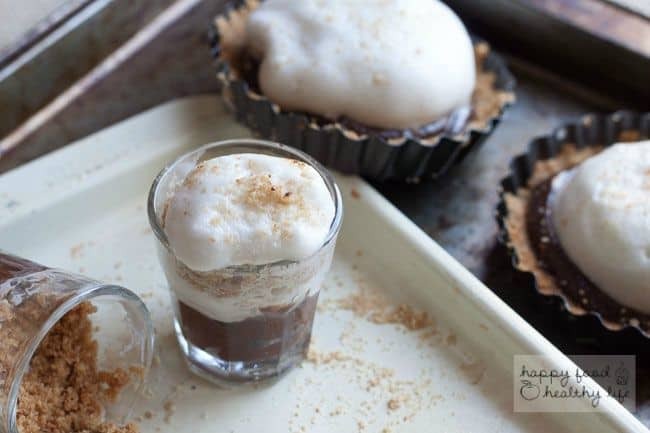 To assemble shooters: Start with 2 small spoonfuls of chocolate pudding in a shot glass. Or you could pipe it with a piping bag. Top with 2 small spoonfuls of whipped cream. Then a large spoonful of unbaked graham cracker mixture. Top again with pudding, whipped cream, and then a sprinkling of graham crackers. Brown lightly with a kitchen torch. 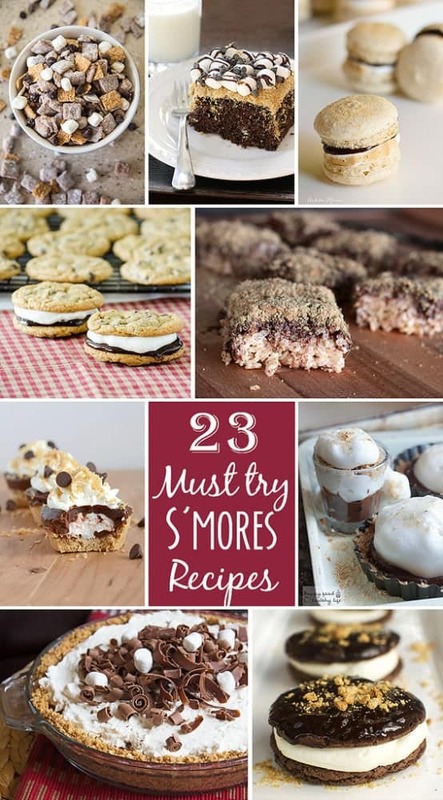 If you’re looking for more S’mores recipes, you’re in luck, because I joined forces with my friends to bring you a bunch more! Check them out! 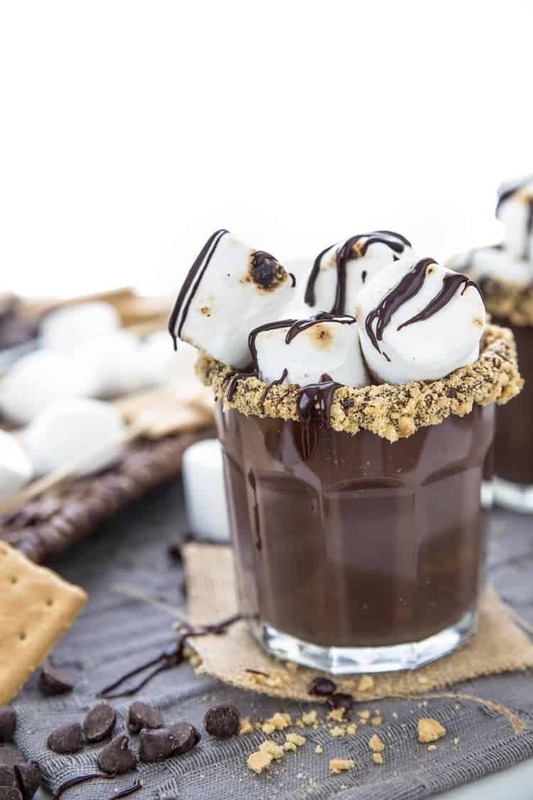 Dairy-Free S’mores Cocktail – Ever feel like you have to choose between cocktails and dessert? Now you don’t have to choose! So impressed with your recipe! You’re not the only clumsy one. Earlier this week I tipped over my cake plate during a photo shoot. Luckily I got a few good shots of the cake before it went crashing down onto the table. And we were still able to eat it, even though it was a mess. LOL! haha, I’m glad to hear I’m not the only clumsy one in the kitchen. That’s seriously my fault in everything – serious lack of coordination. But yes, good food will always taste delicious no matter what form it’s in! Thanks Heather!! I was so annoyed at first when it fell but just had to go with it and ended up loving the spill. Thanks Katie! 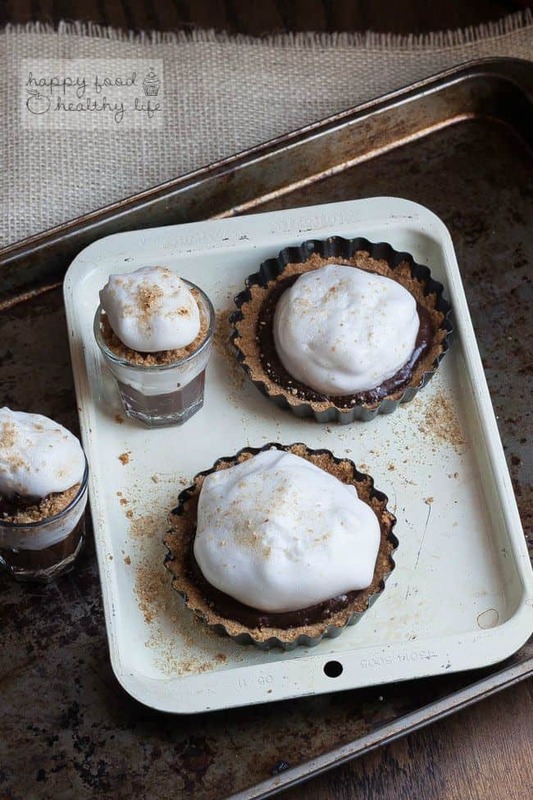 Shot glasses are the perfect size for desserts because honestly, sometimes you really just need a taste to satisfy that sweet tooth, right? I am not even remotely vegan, but I’ve still been on the hunt for literally YEARS for a good vegan marshmallow sub for my vegan friends. I can’t wait to try this method. Thanks for sharing! YES! That’s so exciting. It’s true – vegan marshmallows are hard to come by. And a life without s’mores, well, that’s just not a life I want to be a part of. So this is a great way to get that marshmallow flavor in without the gelatin for your vegan friends. Enjoy! You shouldn’t ever apologize for too many pictures! These are fantastic – and, each one had me drooling just a tad more! 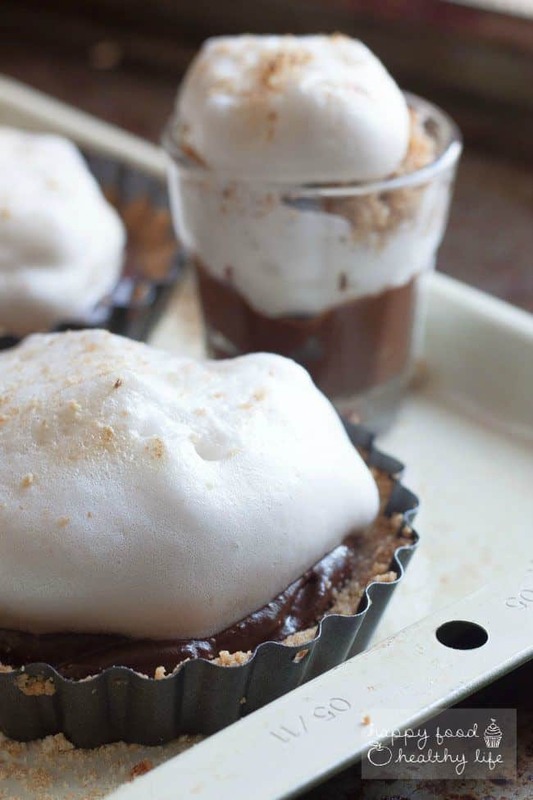 These are a wonderful way to celebrate National S’mores Day! Thanks so much!